Hundreds of thousands of Israelis took to the streets on Saturday night in Israel’s biggest ever demonstration to demand social justice, a lower cost of living and a clear government response to the concerns of an increasingly squeezed middle class. About 430,000 people took part in marches and rallies across the country, according to police. 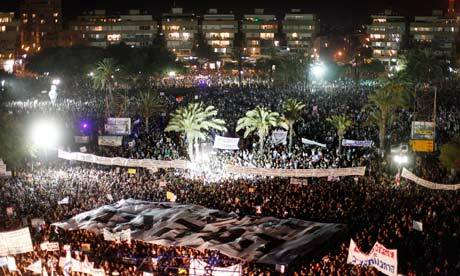 The biggest march was in Tel Aviv, where up to 300,000 took part. There was an unprecedented 50,000-strong protest in Jerusalem, and 40,000 marched in Haifa. There were smaller protests in dozens of other towns and cities. No doubt, some will say that if Israel did not spend such high amounts then they would be destroyed by their neighbours. And some will say that no matter how much time, money, effort and energy Israel spends on diplomacy, and conflict resolution that this will never satisfy Hamas. But I think they fail to see the problem with Israel — Israel’s character as a majority-Jewish state is not only extremely fractious as a global and political regional issue, in that it deprives a large chunk of the population of Eretz Israel, namely the Palestinian Arabs, of citizenship. Israel’s character as a majority-Jewish state is extremely expensive, and deprives Israel’s Jewish and Arab residents of needed spending on social programs, infrastructure, energy, and agriculture. And the same is true for Hamas and the Arab militant organisations — every gun, every bomb, every life lost is a step backward — both in terms of the reaction from Israel (sanctions, retaliation, checkpoints, curfews), and in terms of the wasted labour, capital and productivity. And in some form or another, that is what you get when your economy is tilted toward warfare. It would be far more economical to end the war immediately by producing a one-state-solution, with a secular framework, equal rights for all citizens, and a free market economy. To stop the fighting and concentrate on development. But that is ideologically untenable for leaders on both sides. So in the end, everyone — even the “winners” of the wars — loses. This entry was posted in Current Affairs, International Relations and tagged arab spring, ben bernanke, idf, israel, military industrial complex, military keynesianism, money, netanyahu, people, protests, stanley fischer, weapons. Bookmark the permalink. We’ll never be safe from lunatic radaicals. I feel for the Jews who are attacked by the Lunatic Arabs. I understand their security fears. A two state solution will still see terrorism. It is not like the radicals will sit down and smoke the peace pipe whern their is a two state solution. Fighting is in their genes. Fighting is in the genes of some Zionists. This is human nanture. Many Arabs (Muslims) and Jews are related, some Jews converted to Islam and continued to live in Palestine, others migrated to Ukraine via the Caucuses and then onto other Eastern Europe/European countries. Perhaps the state of Israel has to exist, and the Palestinians compensated with immigration Visas to the West as compensation. Jews in the West can migrate in their place. In time as humanity evolves, we can then be a mixed nation. If you randomly grab any one of the half million Israelis protesting for social justice he or she will be many times better off than any of the Palestinians who lost their homes to those very protesters. I am asking myself a hard question if these people are protesting for justice what do you expect from the Palestinian who lost every thing to those protesters? Israel does not suffer from a high defense spending bill. The vast majority of defense expenses come from American military and economic aid. Israel’s access to American defense technology makes it a good marker for weapons and makes huge profits selling weapons. While their are extremely wealthy Jews in Israel to whom the protesters are looking to share some of their wealth the protesters are failing to look at the misery they caused to the millions of Palestinians who were thrown out of their homes to house the immigrants. Will they consider going back to their homelands if they are not getting justice in Israel? Adel: Looking at inequality in Israeli society, it does look possible that a significant number of Israeli Jews could choose to leave and return to more egalitarian countries that don’t have to live behind a security barrier. Whether the money comes from the U.S. or from Israeli payrolls, it could still be used instead to create infrastructure and benefit all of society, Arab and Jewish. Ideally America would not give any money, and instead of fighting, Israel would use its economic means to create prosperity. Buddy: Fighting between the English and the Scots, or the English and the French, or the Germans and the Slavs, or the Chinese and Japanese went on for centuries. Is fighting in their genes? No. War is a socio-political construct. Buddy: By way of example Aziz listed there is no nation that loves fighting for the heck of it. Over 350,000 nominal Slavic Muslims were slaughtered in Bosnia. Two million or so were killed in Rwanda and there hardly any of the killers were Muslims. Generalizations about Muslims fighting and killing is a smack in the face of reality. Muslims fought vicious wars like Iran-Iraq and 3 millions were killed even with more destructive weapons than the weapons that killed over 20 million Europeans in WWII. European Jews are largely Europeans and there is hardly any Semitic blood in them. Their language is Russian because they were Russian converts to Judaism from the Khazar kingdom. The Germanic Jews are German and their language is Yiddish which is a Germanic language spiced with few biblical words for religious purposes as much as Urdu has Arabic words for religion. Europe must tolerate its Jewish citizens because eventually they will come back to the countries when the dust settles. Yes the bulk of the Eastern Jews are Arabs originating mainly from many Arabian and Yemeni tribes who converted to Judaism. Most of the Yemeni Arabs now around the world who could reach 180 million Arabs from Morrocco to Indonesia came from Jewish heritage. Yemen once was a totally Jewish country (Hemyar Kingdom) before mass conversion happened but still many Yemeni Jews are all over the world including Yemen.